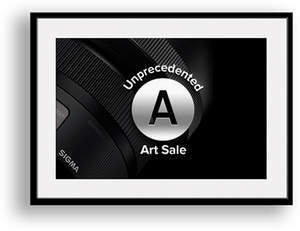 RONKONKOMA, NY--(Marketwired - Nov 19, 2017) - Sigma Corporation of America, a leading still photo and cinema lens, camera, flash and accessory manufacturer, flash and accessory manufacturer, today announced its biggest Black Friday / Cyber Monday sale ever, offering incredible savings on its award-winning Art lens line. For a limited time, customers can save up to $100.00 USD on some of Sigma's most sought after Art lenses. These unprecedented savings are only available through Sigma's authorized US dealers beginning Sunday, November 19th through Thursday, November 30th, 2017. "The time to buy is now," said Mark Amir-Hamzeh, president of Sigma Corporation of America. "The Art lens line sets the bar in both build and image quality. It's incredibly rare to get this wide of a range of unprecedented savings on the critically acclaimed Sigma Art line of lenses." The Black Friday sale makes it easier than ever for customers to add the sophisticated optical performance and high-level artistic expression of Sigma's premium Art lens line. The most significant sale in company history means more photographers are now able to experience the critically acclaimed sharpness of an Art lens for their high-resolution full frame or crop sensor DSLRs. In addition to the Sigma Art prime and zooms lenses, the Mount Converter MC11 for Sony E-mount systems ($249 Retail Price) is also $100.00 off. Save up to $100.00 USD on some of Sigma's Art lenses with their 2017 Black Friday/Cyber Monday sale! Learn more about which of Sigma's award-winning Art lenses will be on sale!